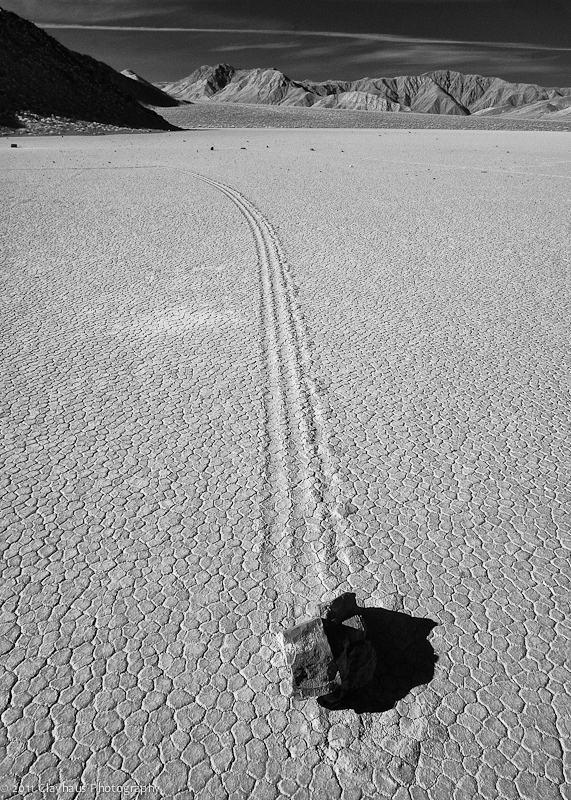 Racetrack Valley is justifiably famous for its moving rocks. 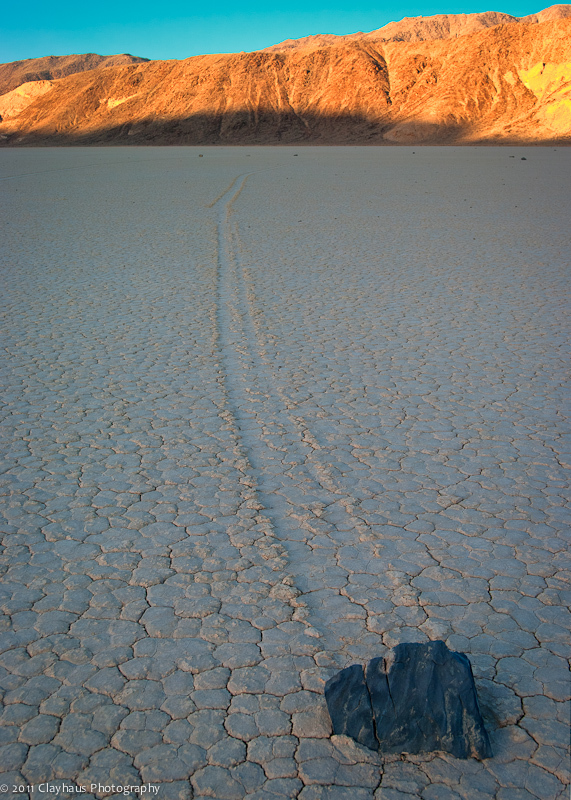 The rocks are mainly scattered about the southern end of the playa and leave long gouges in the now-hard and caked mud. Some of these paths seem impossible with odd angles and strangely placed rocks in the middle of tracks. Theories abound from the silly (aliens and pranksters) to the scientific. 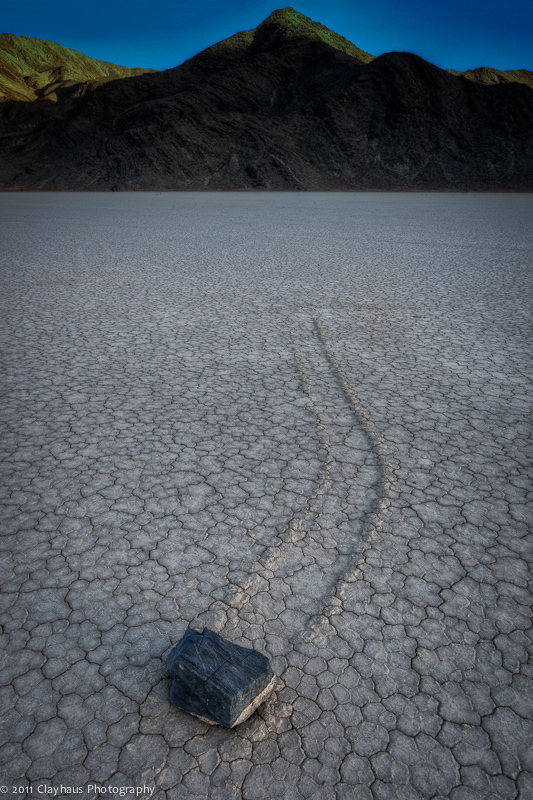 Most of the credible theories revolve around a combination of wet, slick mud and high winds that push the rocks to and fro, in straight and sometimes varying directions. Some of the rocks are large and must weigh upwards of 50 pounds so the conditions must be just so. Of course, there is no record of anyone ever observing this behavior, hence the bit of mystery. While we were there in April a Czech professor – Gunther Kletetschka – and his assistant were conducting research on the moving rocks. Their research adds a new set of wrinkles to the wind and water theories. I won’t reiterate the details as a fellow photographer I met out there has started a thread and done a very good job encapsulating the scientist’s thoughts. 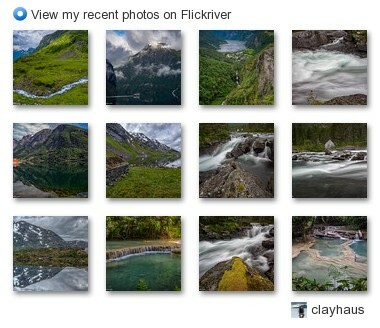 You can read about it here as well as see the photographer’s (Michael Kunitani) wonderful images. I spent one morning and one evening working the moving rocks. There are a couple of obvious ways to approach the rocks from a photographic perspective: either low and centered on the rock or high with an ultra wide-angle capturing the rock and its trail. The previously referred to photographer has some very good examples of the low-approach, whilst most of my images are of the high-approach. Of course, in retrospect I wish I had at least shot a few as Michael did, but I guess I’ll work that approach when I return to the valley. Unless you have cloud cover, shooting during the middle of the day will likely not produce a lot of successful images: the light is generally too harsh. Even if you like strong contrast and sharp shadows, stick to the extremes of the day where you can shoot very pronounced, elongated shadows. So, what to do during that late morning to mid-afternoon stretch? Well, I suppose you could sit in camp and drink beer, but frankly I didn’t drive 13 hours to sit in camp. 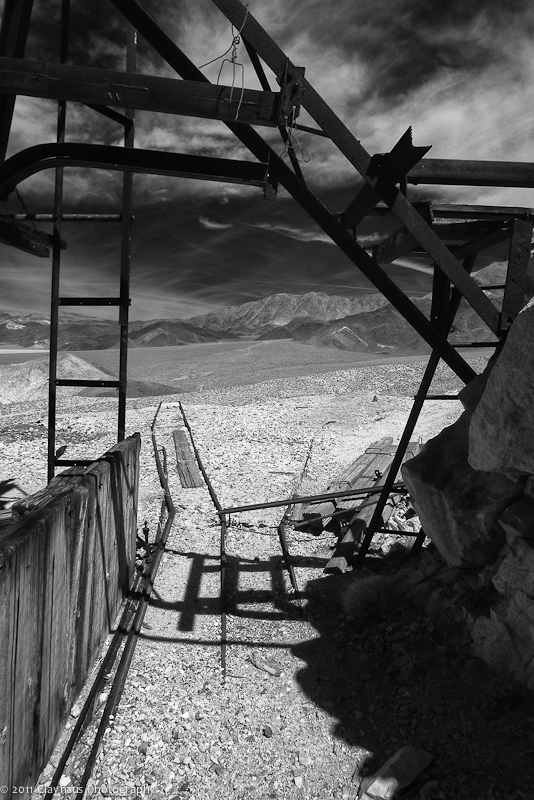 Like most of Death Valley, Racetrack Valley has seen its share of intrepid miners in the last century and a quarter. The mine sites vary from extensive and obvious to minuscule and difficult to find. In fact, at the south end of the valley there was even an optimistically named Ubehebe City supplied by weekly stagecoach service (hard to imagine how ‘pleasant’ that ride must have been! ), but no trace of it exists today. The easiest to see and visit mine site is just a ?? mile or so from the campsites. The Lippincott mine features numerous mine tunnels and shafts as well as remnants of an old mill and a shot-up water tanker. Spelunkers have ventured into the tunnel complex, but for us a short 100 yards or so until it became pitch black was enough (bring a light!). A lead and silver mine Lippincott was in production until the early 1950’s. There is much to see here and a better part of an afternoon can be occupied poking around. 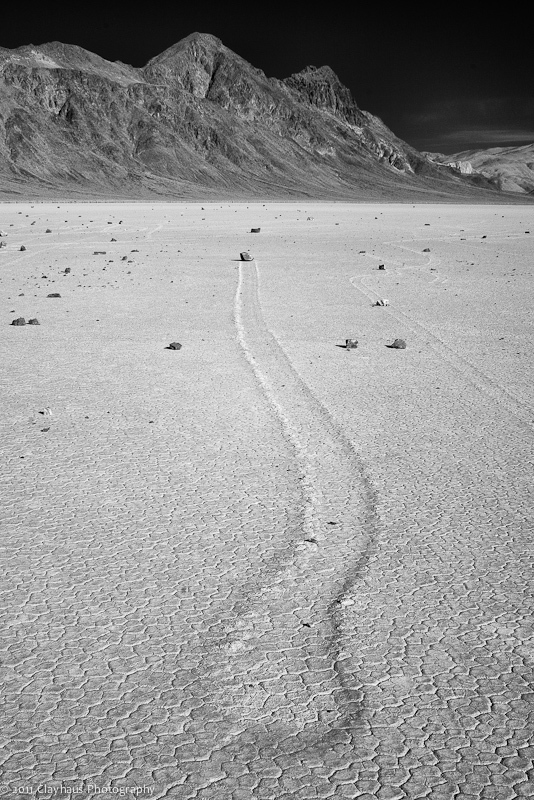 You will also enjoy expansive views of not only Racetrack Valley but also of the much larger Saline Valley to the west. 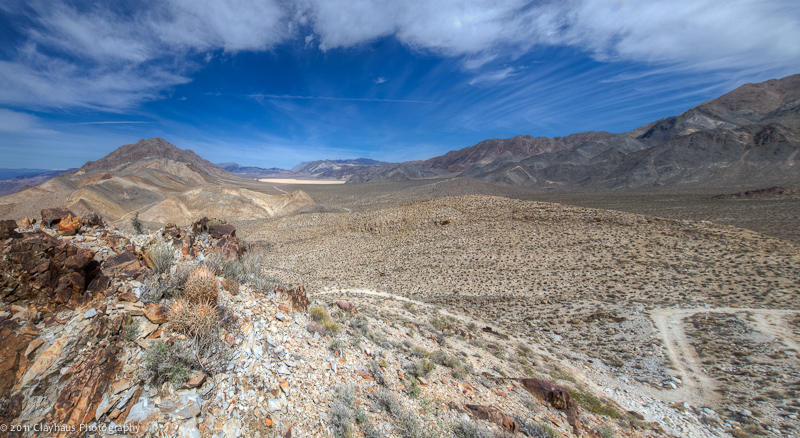 From Racetrack Valley one could drop into Saline Valley via the infamous Lippincott Road. When I ventured down it years ago it was an incredibly nerve-wracking experience with huge boulders and ruts threatening to propel our vehicle into the chasm below. It appears much tamer now as it seems they periodically grade it. From where the road beings its rapid descent you can venture up the hillside due north for a good view of Saline Valley. Continuing on an old track the view opens up even more, exposing the western flank of the Last Chance Range and showing just how long Saline Valley is (~80 miles).?? Returning to exploring Racetrack Valley, a less obvious mine is the Sally Ann Mine. Located in the steep mountainside southeast of the playa, I stumbled around there for the better part of an hour but never could find a trail much less the actually diggings. I did find however the foundation of a campsite with shards of colored glass and bits of crockery strewn about. I also found the old camp dump where the never-very-environmentally-conscious miners tossed their tin cans. The most rewarding exploration in the valley was my sunset race up the Copper Queen Mine/Ubehebe Peak trail. It was our last evening before heading home the next day and I wanted something different. Fortunately, earlier in the trip, I had purchased Michel Digonnet’s informative and essential guidebook, “Hiking Death Valley.” (Since my return I have also acquired his companion book, “Hiking Western Death Valley National Park: Panamint, Saline, and Eureka Valleys. I cannot recommend too highly either of these books. The amount of detail Michel provides is nothing short of comprehensively staggering.) Though the trail is obvious – it begins at the Grandstand turnout – there is no sign and one could be forgiven for thinking it impossible to climb the seemingly sheer eastern escarpment below the towering Ubehebe Peak. But lo, if one squints upward north of the peak towards a quasi-obvious saddle you can see a series of frightening switchbacks. The book claims that this ascent is “one of the most spectacular hikes in this desert” and though my experience in this region is dwarfed by Mr. Digonnet’s, I would merely add that it was awe-inspiring. The race was to beat the setting sun so that I could shoot the Last Chance Range’s advancing shadow across Racetrack Valley. It was late afternoon and the 2 mile and 1200’ elevation gain seemed daunting. For some reason I was pumped and though I stopped a couple of times and moved a bit slowly through the last few very steeply pitched switchbacks (there are a total of 36 of them!) I crested at the saddle in 45 minutes. The view below was stupendous. And, indeed, I was able to photograph the shadow to my heart’s content. 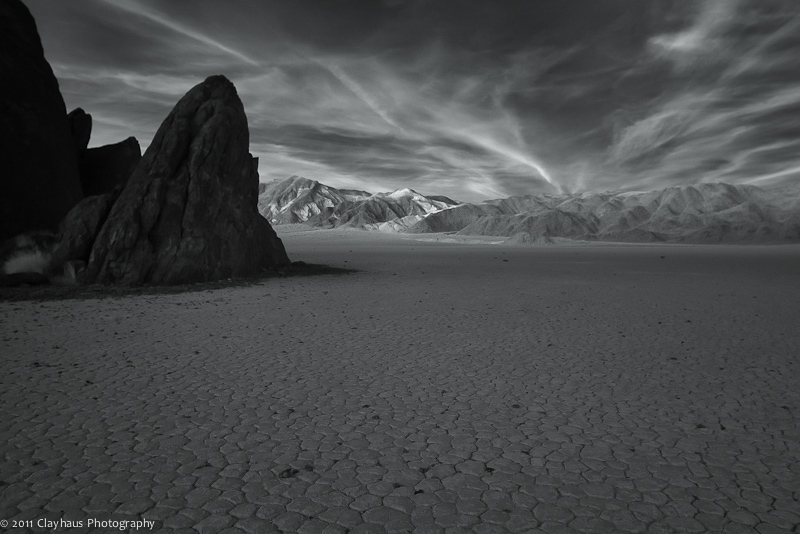 To the west, Saline Valley was in shadow from the even taller Inyo Mountains. If the sunset had not been a concern I could have continued to climb south to the summit of Ubehebe Peak (another mile away and 800’ higher) or descended a 1000 plus feet to the Copper Queen Mines. But those will have to wait until another visit with more time. Our final venture was to photograph the Grandstand in the day’s fading light, so I couldn’t tarry on the high divide and instead raced down the twelve hundred feet back to the playa. We brought lights to shine on the aptly named Grandstand (located in the middle of the north end of the dried lakebed) but for me the after-dark experiment of shooting infrared yielded startling and alien-esque images. 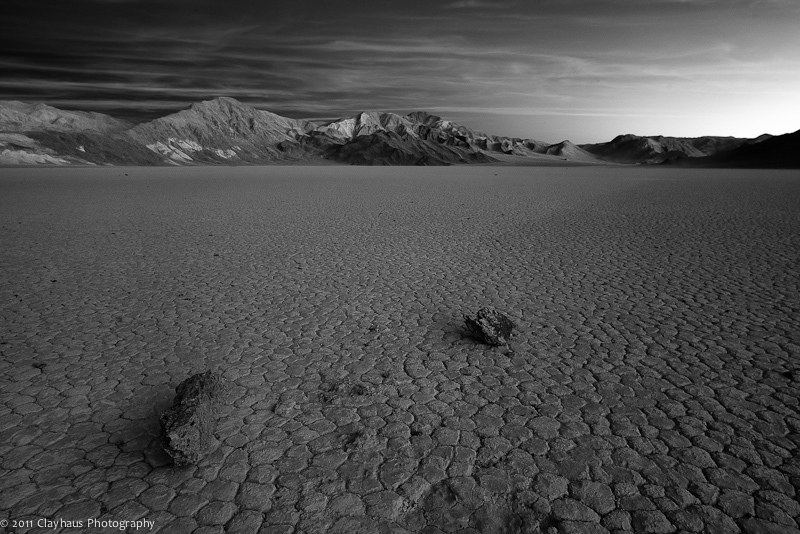 It had been 27 years since I last explored the vast desiccated world of Death Valley, but it was pretty clear that I would not wait another quarter century to return: Spring of 2012 can’t come too soon!